Lucid Insiders talk about how online advertising systems are unaware of the offline advertising that is going on around them, although when one drills down into the online data it is apparent that them. What to do about television driving a spike in demand through an online sales channel? The number of smartphone owners in the EU-5 (UK, France, Germany, Spain and Italy) grew 41% between 2009 and 2010, to 60.8 million subscribers, according to a June 2010 report from comScore. Technology start-up PubMatic is launching a new tool to help websites determine how many tracking files are being installed on usersâ€™ computers. Hot on the heels of recent news about local display advertising, here's some news about local mobile. Guess what? Somebody predicts this market is growing to grow. Are bigger ad formats the way to go? I have been thinking about this for some time and i think fewer but bigger and better ads is the way ahead from premium display. Am I right? Is audience data more valuable than advertising inventory? iMediaConnection.com reporting that there is evidence suggesting that audience data collected over the course of a campaign on a major site or network could be five to 10 times more valuable than the actual messaging or creative on which it is based. Some interesting points about managing frequency in digital advertising and a note that advertisers are still not demanding audience reporting. Smart move from Blackberry – pooling app inventory and passing to partner ad networks is a good way to get monetisation quickly. 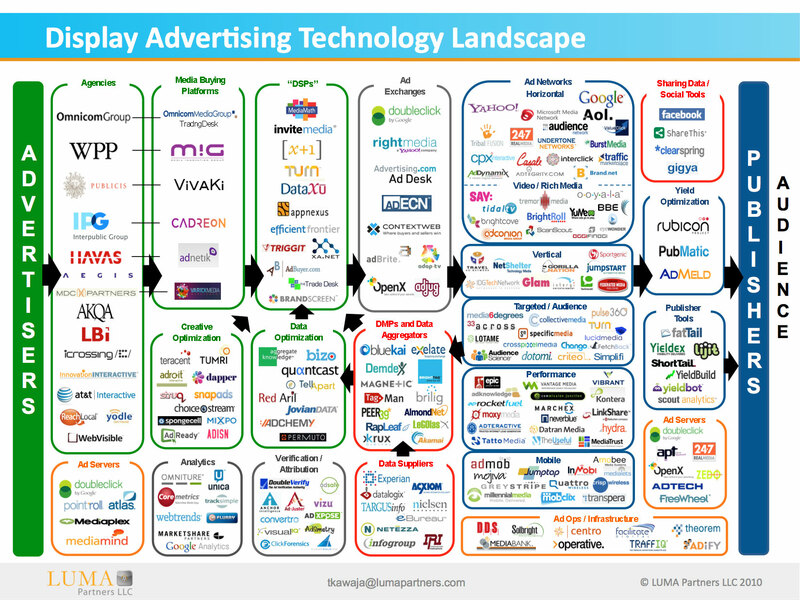 This is the latest version of the display advertising landscape diagram. Lots of companies, lots of players and much consolidation to come? eMarketer reports that retargeted display ads gave a 1,046% lift in searches on brand terms within four weeks after exposure. 4 weeks seems a long period – or is that just me? BusinessWeek suggests that Apple's share of the mobile advertising market will be 21% by year end. I have to assume that's on revenue and not impressions or any other volume measurement because this article doesn't really make it clear. Itâ€™s not surprising to have heard a number of suppliers at last weekâ€™s ad:tech conference bemoan the technical confusion arising from our industry: which technologies should be adopted and what can they do for their businesses? At least one mainstream publisher suggested there were simply too many technologies around and there wasn’t enough time to evaluate them all. Ah, I know what you’re thinking. Somehow we missed each other last week. But I was on holiday in a place that was, blissfully, somewhat disconnected for me. Still, the last week was frantic. Back from a break and straight to Ad:tech at Olympia: it’s the trade show to connect the London digital advertising industry. It is, apparently, where ‘the online marketing and advertising community will gather together’ to reveal the latest trends and market figures, share best practices and address industry challenges. The main challenge I learnt: buy more comfortable shoes! And for those heading to this New York’s Advertising Week, remember your ‘phone charger. As I didn’t do the paid-for conference I didn’t get to see the good folks from Twitter talk. There was much buzz about that but surprisingly light Twitter talk on the official #adtechuk hastag. I think it needed promoting a little better. But, of course, there was a social media buzz last week helped along nicely by Google telling us ‘Social recommendations can revolutionise online advertising‘. If you see my Twitter feed then you’ll know I am a big social media fan and I do think ‘social’ can change advertising but putting Twitter feeds into ads may not be the way (I know, it wasn’t the only thing they suggested). Really? Stop using the internet or just those services which have decided to charge? The devil, as always, is in the detail and thatâ€™s perhaps one to look at in more depth another week. Staying with the publisher business, in a tweet from the Ad Trading Summit, Improve Digital’s @janneke_improve reported â€œLarge publishers will win unless niche publisher are able to monetise audience which makes a lot of sense to me. Of course all publishers are looking at how their future digital advertising may play out. I would argue that putting a price on the right content may well work for some print publishers. There are lots of examples where it is working and scarcity will always be paid for. Didn’t Sky Sports show us the way? As an aside, I wonder what Sky make of the BBC, ITV, Channel 4, TalkTalk, BT, Arqiva, Channel 5 joint venture for on-demand television services being branded YouView. Personally, I think itâ€™s a really smart name but I can imagine some trademark lawyers had much fun (and decent bonuses) clearing it. The partners in the venture were, no doubt, intrigued to read research from Dynamic Logic telling us that ‘TV commercials repurposed as online ads perform less well on many metrics than videos especially developed for the online space’. I wonder how many created-for-television ads are run by those companies on their sites versus copy created especially for an online audience? I’d wager there’s more research on this to come as the survey also suggested television copy performed better under some circumstances. How are creative and planning-shops to use this do you think? In other news, is the EU really cracking down on targeted advertising or are they making some sensible privacy suggestions? As we have noted before, privacy is key and I’m sure we, as an industry, can achieve the right balance. Perhaps noises-off (from Brussels) will get the industry there a little more quickly. The EU is also reported as having suggested that the use of Flash cookies for some purposes as illegal under European law. Clarity on this matter is, surely, a good thing and I’d be interested in seeing a proper ruling, if anybody has one. This week, privacy was cited as a reason some people are choosing not to opt-in to SMS/MMS advertising. Research from the Internet Advertising Bureau and the Direct Marketing Association found, ‘64% of those surveyed did not want to opt-in to SMS or MMS because they thought they may have to share personal details’. The research also noted that 75% of respondents said, ‘they would be happy to opt-in to such services, given the right incentive, such as attractive offers, money off vouchers or priority service from a brand’. I wonder how good the offers would have to be to get that many people opting-in to more than a minimum of brand communications this way? Surely, just a few become intrusive very quickly. Now, we’ve talked about Borrell Associates research numbers many times over previous weeks, noting in particular their research suggesting a bumper cash bonanza ($16 billion in 2011) for local (digital) advertising. Well research firm BIA/Kelsey thinks that is a little conservative. They suggest that local online already has 15% of a $133 billion local market (predicted 2010 numbers). eMarketer reports, ‘By 2014, BIA/Kelsey expects nearly one in four local ad dollars to be spent on digital’ which is pretty impressive, don’t you think? As with other editions of ‘Last Week In Digital Advertising‘, this week’s scan of the digital advertising news shows that the industry has come a long way but also has a long way to go. It’s not surprising to have heard a number of suppliers at last week’s ad:tech conference bemoan the technical confusion arising from our industry: which technologies should be adopted and what can they do for their businesses? At least one mainstream publisher suggested there were simply too many technologies around and there wasn’t enough time to evaluate them all. We did hear that a data-driven display market is inevitable (so, you’re sunk if you don’t have your privacy in order) and brand safety is paramount (to both advertisers and publishers, who don’t want the wrong advertisers compromising their content). As with any other modern business, it seems transparency is the key. The research found consumers are already receptive to the idea of mobile messaging â€“ with a fifth (21%) of consumers already opted-in to receiving SMS and/or MMS from brands and their own mobile networks. Three quarters of respondents stated they would be happy to opt-in to such services, given the right incentive, such as attractive offers, money off vouchers or priority service from a brand. Phorm has served its first targeted ads to opted-in users in Brazil. This will be an interesting one to watch. TV commercials repurposed as online ads perform less well on many metrics than videos especially developed for the online space, research from Dynamic Logic has indicated. One of the most common mistakes brands make in the digital space is the "me too" syndrome. A certain platform performs well for other companies, gets a lot of media attention, and suddenly it's, "We need one of those too." Local advertising spending is holding up better in 2010 than previously expected, according to estimates from BIA/Kelsey. The firm, which initially predicted a nearly 1% drop in overall local ad spending this year, forecast growth of 2.1% to $133.3 billion by year-end. The Telegraph reports that companies need to embrace social media, just as their customers have done, says a senior executive at Google. Online advertisers and technology companies have been warned to act â€œquickly and responsiblyâ€ when it comes to privacy regulation if they are to avoid regulation. The European Union is currently implementing the privacy and electronic communications directive, which sets out new rules for dealing with â€œcookiesâ€. Video is, of course, a popular digital advertising topic. Itâ€™s rapidly evolving and weâ€™re seeing good adoption from those of us watching to those buying & selling the space. My new favourite website name, newteevee, quoting ComScore, reported that 1.4B minutes of live online video was watched (in the US) in July. Thatâ€™s an impressive 600% growth, which Business Insider happily charts for us. Last weekâ€™s Last Week felt a little like a bumper edition because there seemed so much I didnâ€™t have space to mention. One item stands out and deserves a mention. The UK Advertising Standards Authority (ASA) extended its existing self-regulatory rules for digital media to cover advertisersâ€™ own websites and advertiser controlled marketing communications in other non-paid for space, say the UK IAB. That should be welcome news to marketers because a few rules are good boundaries, arenâ€™t they? The move got a lot of coverage but it struck me there was little mention of the fact that ASA already has a remit in the digital space and I would have been interested to understand what they had discovered as theyâ€™ve been following a digital path. So, somewhere weâ€™re looking to find a balance. I was particularly impressed on Friday by a post of the Ghostery blog being particularly open about their privacy policies and why theyâ€™d like us all to opt-in to a data collection exercise, â€œGhostery is free to use, but itâ€™s not free to maintain and make better. Weâ€™d really like you to participate in GhostRank, because itâ€™s safe for youâ€ and they go on to explain their data collection policies. The main point: collecting the data supports this free tool. Ghostery, if you donâ€™t know, is a nice little browser plug in that tells you what tracking pixels, beacons and other such things are on any given web site. It’s very useful and I’m more than happy to send them some data in return. Iâ€™m not sure Iâ€™d heard of Borrell Associates until last week (when I quoted their report that predicted a rise in online display targeting) but they continued to get coverage for their work this week. I noticed brand-e.biz picked up on the video aspect of their report, noting that the â€œstreaming video format is expected to continue its dramatic growth, increasing more than 60% to $5.6 billion next yearâ€. Video is, of course, a popular digital advertising topic. Itâ€™s rapidly evolving and weâ€™re seeing good adoption from those of us watching to those buying & selling the space. My new favourite website name, newteevee, quoting ComScore, reported that 1.4B minutes of live online video was watched (in the US) in July. Thatâ€™s an impressive 600% growth, which Business Insider happily charts for us. Meanwhile in the UK, the IAB reports that almost 50% of the media buyers polled in a recent survey stated they planned to spend more money on Video On Demand over the next six months. Broadcast Engineering, a journal donâ€™t tend to follow, reported, â€œThe number of U.S. households with broadband service that watch full-length online video on the TV will reach 57 million by 2014, according to a new report from researcher In-Statâ€ which, if the trend is followed this side of the pond, is great news for Yahoo!, who â€“ according to reports – plan to launch their Connected TV product in Europe at the beginning on 2011. YouTube rolled out some new targeting features (basically a set of restrictions on age or page URL that will go some way towards helping brands feel safer advertising on the platform) and, by a happy coincidence, that TippEx bear ad (viewed on YouTube) went viral and managed to show that online/digital video ads can be so much more than running your TV spot. I liked it although I am not sure how it would stand up to repeat viewing. Hearing that newspaper ad revenues have slumped isnâ€™t really a surprise to anybody. In my opinion, a Newspaper Association of America report (quoted by Reuters) saying that newspaper â€œonline revenue rose nearly 14% to about $744 million in the second quarter compared with the same period a year agoâ€ can only be a good sign. If newspapers can, eventually, see a way through with digital advertising what will that mean for pay-walls? I read reports of a crack in a pay-wall on Friday. Is there more to come on that? Borrell got another mention, over at MarketingVox, in an article that also hinted at the â€œcommoditization of display advertisingâ€. I think there is a real risk of that, but innovation remains great in the digital display business which should hold off any commoditization for a while at least. Picking up on the targeting theme that I had things to say about last week, MarketingVox noted that is was the technology â€“ which of course, powers the targeting â€“ that can drive displayâ€™s growth. Iâ€™m not sure itâ€™s the most innovative thing Iâ€™ve seen, after all page-peels and interstitials have been around for a while, but I do like Undertone Networksâ€™ PageGrabber format that they announced this week. Of course itâ€™s not all going to be technology and big formats that get brands online. Zach Coelius, CEO of Triggit has a good piece on how to bring brand dollars online. Reassuringly, display ads are still worth buying (if you do it right) according to Mashable (The Future of Ad Agencies and Social Media). In the section thatâ€™s never before been titled â€˜stuff we didnâ€™t know last weekâ€™, we discovered that women â€œdeliver a 23% higher click-through rate than men, but after clicking, men follow through with an actionâ€ (Bizo via MarketingVox); 78% of millennial internet users engage with social media compared to less than 45% of their parents’ generation (Harris via eMarketer) and, a local UK stat, more than 30 million UK individuals now go online every day (ONS via eMarketer) but three-fifths of people 65 and older have never gone online. As part of a feature on Google advertising their own display business, we were told Googleâ€™s display network consists of over 1 million partner sites (New York Times). They may just need to grow that number as another chart-of-the-day told us that time spent on Facebook was greater than time spent on Google sites in the U.S. in August for the first time in history. That figure was helped on, no doubt, by news that older users have been rapidly adopting social media (Pew Internet & American Life Project via Adotas). Facebook’s growth would be appear to be unstoppable for now. Finally, back to privacy. Ars Technica reported on another cookie type thatâ€™s not cleared by standard browser settings; this one utilising HTML5â€™s local storage options while, also on a privacy theme, Adotas ran an interesting piece on retargeting which did summarise part of the story they told with, â€œWhat actually seemed to creep her out was that Internet display advertising was effectiveâ€. Eric Picard, on iMedia Connection might have summed it up best with, “when we make them [consumers] feel like someone is watching over their shoulders as they do things online, make no mistake — they resent it.” And therein is, perhaps, a lesson for us all. Effective advertising is likely to get attention and that means weâ€™d better be doing it properly. There’s always a ‘they’ and, in this case, ‘they’ say life begins today. If that’s true then quite what the past forty years have been I have no idea. For some reason that I have yet to understand, turning forty is a point when people look back. They don’t do it so much at 39 and, I imagine, not so much at 41 either. Still, maybe it’s not such a bad thing, this looking backwards. Perhaps looking back helps, as someone once said, refreshes the eye, “to restore it, and to render it the more fit for its prime function of looking forward”. Or perhaps it’s just what we do. A potted geography would look like this: around forty years ago I arrived in this world in a place that wasn’t too far from the wooden planks that made up the place Wigan Pier would have been had it really been a pier. I was too early for it to have been the tourist attraction it became. As I entered the second decade of my life – around the point they thought they should have a pier tourist attraction and the moment the new romantics took over the music scene – you would have still found me in Wigan (where, I was reminded earlier this week, Spandau Ballet’s To Cut A Long Story Short was the first record I will admit to buying). We got used the fact Kajagoogoo’s Limahl, who was a local boy, was being played on the radio and it was somewhere around this time that I became fascinated by the voices coming out of the radio. By the middle of the decade we lived in Shropshire, where my first proper paid job was for BBC radio there, and by the end of it I was in studying in Scotland. At the height of the Britpop 90s I’d moved to London, trying to make advertising systems work, first for those voices in the radio box and then for the emerging online industry, and that’s where I’ve been ever since. I entered my 30s as we took in the new millennium, realised that I was lucky to live in the most vibrant place in the world, and was working with computing systems all days long. Like father, like son, huh? The geography provides the markers on our own life-map but, of course, it’s the people who provide the highs (and, I guess the lows) which make up the contours on our map. And, while I take my moment to reflect I want to say ‘”thank you” to everybody who has made the last forty years so wonderfully rich. When I was a child I imagined you would get to this point in life and you’d be able to write your own life’s acknowledgements, as though life was bound between two hard covers, but now I’m here I’m fully aware that it’s not the final chapter so the words won’t get written. Plus it’s hard. Of course, my family have been there throughout but I am not sure you can ever repay the debt that you owe them. But Mum, Dad and Jez have been there from the beginning (well, not Jez, he was some months later) and, while the bad bits are all me, they should get the credit for guiding my good points. Friends come and go in your life (and, thanks to the wonders of Facebook, they come back too). I don’t want this weekend to pass, however, without thanking all my family, acknowledging all those I’ve met along the way who’ve made sure this has been a blast and, of course, to Paul who – when I add it up – has been here for more than half of it and really makes it all worthwhile. So, I’ll raise a glass to all of you. Here’s to whatever the next forty bring. Are bigger ad units the way to make digital advertising more effective? Good news for the online video market: Almost 50 per cent of the media buyers polled stated they planned to spend more money on Video On Demand (VOD) over the next six months. HTML5 and client-side storage can have implications for privacy surrunding advertising. Here’s the latest information from Ars Technica. Whatâ€™s So Creepy About Retargeting? Newspaper are having a difficult time recovering from the slump but online revenue rose nearly 14 percent to about $744 million in the second quarter compared with the same period a year ago, yet it still could not offset almost an 8 percent drop in print advertising. ClickZ looking at how Google’s Priority Inbox – and other things – impacts email marketers. It has another take on the engagement metric which is becoming popular – how often we interact with senders is good way of understanding what kind of messages we are receiving. Great piece at Mashable which is really the opinions of some ad agency-types on how digital media is changing the world of advertising for agencies. “Location Campaigns Are the New Targeting Mechanism” is just one of the headlines. Can Marketers Catch Up with Millennials? Experian Simmons data on attitudes toward advertising, quoted at eMarketer, shows 18- to 34-year-olds are actually more open to advertising than the general adult population. Fewer millennials said they did not like advertising and did not let it affect their purchase decisions. Another web-to-tv story: “Web-to-TV Gaining Momentum in the U.S.,” forecasts revenue from the sale of Web-to-TV video content to grow from $2 billion to more than $17 billion by 2014, says In-Stat. Unfortunately, the rest of the data is behind their paywall so we can’t say much more. There’s a number of articles today about technologies connected the web and television. Lot’s of people have been trying to do it. Can Yahoo! succeed when the bring it to Europe next year? Rajeev Goel, CEO of PubMatic, says “Data leakage” sounds nasty. It does so he talks about gardening. Who’s plucking your data? t sounds better than theft and an interesting point – publishers can learn from those who are selling their audiences. On the Microsoft Advertising blog a case study on how Microsoft used digital to increase brand favourability metrics around the launch of Windows 7. It might be Microsoft using Microsoft as a case study but I think it’s worth reading about their use of digital around a major consumer launch. Did you miss me? Go on say you did. Last week was a bank holiday in the UK and we skipped â€˜Last Week in Digital Advertisingâ€™ which just means that we should have more things to talk about this week. If youâ€™re outside the UK and youâ€™re interested then I should say that bank holidays are really just public holidays with a fancy name. Originally they really were holidays observed by the Bank of England but are now much extended. And, as many of you think we take too many here in Britain (we have 8 of them), I’ll point out that we used to take more than 30. Of course I would have to have been alive in 1830 to get that many. Which I wasn’t! Amusingly, one of Britainâ€™s newest banks doesnâ€™t close on half of the bank holidays, so we probably should rename them. Banks are, of course, a nice place to store some of that new digital revenue reported by The Rubicon Project (Digital Ad Spend Grows 47% In The First Half Of Year) or next yearâ€™s bumper cash bonanza for local advertising (Local online advertising market set to top $16 billion in 2011) that was covered by John Cookâ€™s Venture Blog, which, in turn, was quoting a bullish Borrell Associates report. As somebody who works with the technology of digital advertising, it never ceases to amaze me when I see comments that suggest targeting is the next big thing online. Targeting â€“ of all sorts and in many guises â€“ has been possible for years (although clearly very disguised, as nobody seemed to know it was there). Iâ€™m never sure if itâ€™s the publishers who thought it was too complex a-sell or the buyers who thought it too complex to plan but it’s been possible for a very long time. Of course, itâ€™s easy news copy and itâ€™s hard to argue accuracy when so many people have been using â€˜run-ofâ€™ advertising very successfully. Michael Nutley, in his Marketing Week column, repeated concerns among some brands and media owners that traditional media agencies arenâ€™t taking full advantage of the complexities of the digital world. So, if itâ€™s true that “They’re not buying mass anymore; they’re buying niche,” as ClickZ reports Borrell saying, then I think itâ€™s great for digital. Blackberry maker, RIM, will have to dig deep into its bank account if stories suggesting itâ€™s about to pay $500 million dollars for a mobile advertising company are true. Readers will notice that mobile keeps cropping up because itâ€™s either a genuine hot topic or, perhaps, we just continue to think itâ€™s â€˜hotâ€™ because we all know thereâ€™s something in it. As if to underscore mobile computing is key, eMarketer surveyed a bunch of people (see, thatâ€™s the analyst in me) and found that 18-29 years old (the so-called Millennials) â€œwere more than twice as likely to label cell phones a necessityâ€ when compared against an older audience (their figures:59% vs. 29%). Mobile marketing business AdFonic suggests the mobile ad industry needs to ensure that itâ€™s matching the rest of online with transparency in advertising reporting (Transparency is key driver of mobile ad spend) â€“ which is certainly true in a cross platform world. As an industry, transparency in what we deliver is important but, as always, there are challenges. The ad-operations forum at Admonsters noted that â€œ[c]ounting discrepancies in impressions, page-views, and other visitor data impact every online tracking company, publisher, and marketerâ€ which shows why we continue to have challenges building and integrating smart digital ad technologies. Thereâ€™s a lot to be covered when looking back at the last two weeks in the digital advertising world so letâ€™s do some quick stats. Foursquare, the fashionable location-based check-in service, is now at 3 million users. TechCrunch thinks it will be a 4 million soon. I wondered, on Twitter, if weâ€™re approaching a location advertising tipping point (don’t you love how social media allows you to reference yourself?). Microsoft knows mobile is valuable and is reportedly digging into itâ€™s bank account to spend $1billion promoting Windows Phone 7. Keeping with a running theme in this column, NewTeeVee reports that almost half of all people in their survey (which was, reassuringly, global in nature and conducted in the U.S., the U.K., Sweden, Spain, Germany, Taiwan and China) watch online television content every week (although does go on to note the continued strength of linear television). The continued popularity of online television services may be a reason why the UKâ€™s Channel Five rejoined the internet-connected television consortium that is Project Canvas. Buzzword of the fortnight goes to â€˜engagementâ€™ which has become an oft-quoted, never-defined advertising measurement metric. It was reported that Twitterâ€™s promoted-tweets advertising concept increased engagement by 50% (if engagement was measured by clicking and re-tweeting: so the click metric then?). For P&G, however, â€œengagement included watching an embedded video, playing a game or signing up for a newsletterâ€. In that previously mentioned Michael Nutley column we see that itâ€™s a measurement thatâ€™s causing some concern amongst publishers and eConsultancy has a nice piece examining the engagement concept and trying to determine what it really means. That seems like a lot for this week, doesnâ€™t it? And I havenâ€™t even ventured into the latest stories surrounding the privacy implications of digital advertising (Ad Firm Sued for Allegedly Re-Creating Deleted Cookies). Oh look how I squeezed that in. If only I was paying myself something for clever segues. I’d have a reason to visit the bank now. It is, after all, open today. Good post from ClickZ on the positive effects behavioural targeting can have on understanding audiences & qualified customers. Adfonic have an interesting take on the mobile advertising business with a blog post about data transparency in the mobile advertising sector. Can anybody validate the arguent that the mobile advertising has less detailed reporting that the online display business? StrategyEye reviewing the recent Google Blog post on the publisher display advertising business. To be honest, I am not sure what the line ‘as it tries to challenge Yahoo!’s dominant position in the market’ refers to in the context of this post. Yes, Yahoo!’s display business may be bigger than Google’s own but the blog post is talking about the technology for publisher business and Google’s DoubleClick has an enormous market share. This was poste earlier in the summer but I wanted to make sure a record was kept of it as Tom makes a lot of interesting points about publishers and data. How are you protecting your data assets?